The story, as you can see, follows the true story of Ron Woodroof, who sought out unapproved drugs and supplements after being diagnosed with AIDS and given one month to live. Woodroof built an underground collective of alternative AIDS treatment and survived six years after his diagnosis. Key among the supporting cast are Jared Leto (Requiem For a Dream) and Jennifer Garner (Juno, Alias). Leto plays a cross-dressing AIDS victim named Rayon who helped Woodroof launch the buyers club, while Garner is both Woodroof’s love interest and a doctor that gives the audience perspective inside the FDA system while Woodroof operates outside of it. 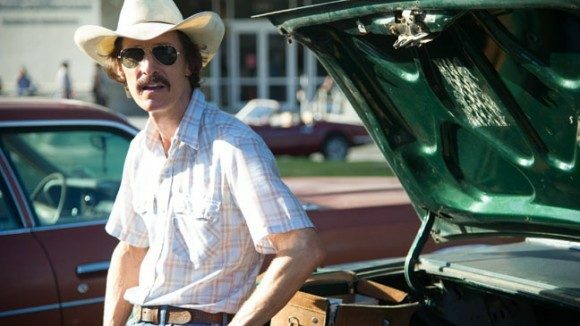 Dallas Buyers Club is set to premier at next month’s Toronto International Film Festival. Along with the trailer came news that the theatrical release date is being moved up from December 6th to a November 1st limited release, presumably so the picture can open against less competition in a busy awards season full of high-profile films. Expect the film go wider by December, especially if early returns are positive. Dallas Buyers Club was directed by Jean-Marc Vallee (The Young Victoria, the upcoming Wild) and written by newcomers Melisa Wallack (Mirror, Mirror) and Craig Borten. Focus Features will be distributing.